There have been some lovely catch-ups with friends across the country this month. It's lovely having an excuse to get out of London and spend the day cuddling little people. From baby Bella and all her gorgeous fluffy hair to playing with barbies and colouring in with my gorgeous god-daughter Izzy and one-year-old toddling Tilly. I so wish I could see them all more often, but alas that's not to be. But at least my visits with them both mean lots of lovely arts and crafts! Moments of quiet to read, read, read and read. This month has been a stellar month for good books and I can't wait to share them all with you imminently. Chilling out on the sofa in my pjs and drinking tea whilst ill - sometimes you need to give yourself down time and let the batteries recharge, or at least I needed to this month. I was lucky enough to visit Amsterdam this month and it was glorious, some of my favourite things about the weekend were the little bits - the beautiful flowers, the lazy lunches and the hours spent nattering away as we stumbled across beautiful sites. It feels like we're finally making progress on the whole house moving thing this month and I'm excited to see what happens with it all this month. Sometimes you just have to make the decision and take the jump into the unknown. Exploring my home town never gets old, from ambling along the Southbank, to visiting new tourist spots (the Cutty Sark), running past Big Ben or simply my walk to work, London is such a stunning city. To put it simply I love this city. Having a three hour train journey all to myself means enjoying lovely magazines and yummy coffee. It's most certainly spring in London town right now and whilst I still live in a flat without a garden I'm trying to bring the outside in as much as possible, so it's all about the amazing flowers. These stocks are my favourite from the month as they smelt so spectacular! Skype sessions and text conversations with my little sister, that always make me smile. I love technology for keeping in touch with my favourites. Finally having some time to cook lovely food. I feel like I've barely been cooking over the last few months, I've wither been out or about or just bunging a jacket potato in the oven, so it was nice to finally get in the kitchen and cook some healthy, and not to mention yummy stuff. One of my favourite bloggers, Belinda from Found Love. 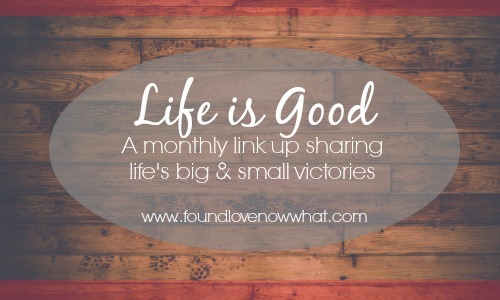 Now what?, had started a new link up all about the victories we have in life, which fits my little monthly update perfectly. So I'll be linking up with her on a monthly basis, why not join in and link up too? Plus you can see what everyone else has been up to too! this is such a contented post! love all those photos of London, obviously :) train rides out to Suffolk were bliss, with my magazine and hot chocolate (always) and Jon's newspaper and latte (always) - we shared the most companionable silences.